All of our products have varying shipping fees depending on the products ordered and the quanity ordered of each. Our larger canvases are bulky and quite heavy to ship. Our delivery price on these items reflects the larger delivery price required to deliver a large item safely. These are only available to be shipped within Australia unless prior shipping fees have been quoted for areas outside of Australia. By popular demand groovy goose is now shipping internationally! Any of our PAPER BASED products such as CARDS, MILESTONE CARDS, PARTY STATIONERY & A4 SIZE PRINTS incur the same delivery fees as within Australia. Please contact us at info@groovygoose.com.au for a quote on delivery charges, as it will be based on your location. For all international orders we only accept PayPal for payment. All groovy goose products are custom made especially for you at the time you order...we don’t keep stock on shelves getting dusty! Generally we require up to 7 business days for your order to be made (after payment has been received and cleared) This allows time for your personalised products to be produced. 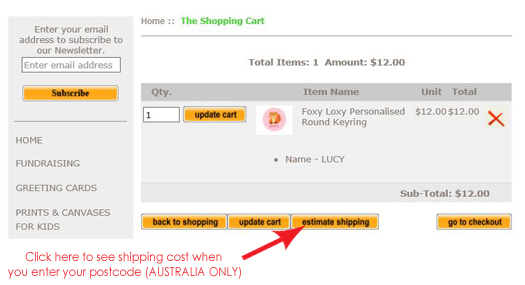 Time is then needed to allow for delivery via Australia Post. All orders leave from metropolitan Adelaide. During regular periods of the year Australia post quote 3-5 business days to most cities in Australia. Delivery times depend on the package’s destination, and the time of year. The Christmas season (starting mid November) can be especially busy. At this time we recommend you order well in advance to allow sufficient time for your products to reach you. Some delays could be experienced at this time. Delivery will be delayed during times over public holidays also. As a general rule it will take between 1-7 business days to be delivered once it leaves our studio. So your products will arrive approximately between 8-14 business days after you place your order and all payments have been cleared. If you require your goods URGENTLY or need them to be tracked please contact us at info@groovygoose.com.au and we will be happy to quote you an extra fee dependant on your delivery area and how quickly you require your goods. In this case we suggest payment via paypal as funds are cleared immediately and your order can process straight away. Cheques and direct deposit require a few days for funds to clear. Work will not commence on your order until all funds are cleared. All groovy goose products are securely packed for you before they leave our studio. We have worked hard to produce a high quality product and we want it to arrive in your hands in the same condition we sent it out. All our canvas art products, fine art prints and poster prints have been packed securely so they reach you in perfect condition. All our canvas products are made of a solid box frame, and then we use protective card corners and high quality cellophane to protect the surface of your piece of art. We then package it in specially designed high quality twin flute cardboard shipping boxes(about 6-7mm in thickness) so they are extremely robust! All our other goods are securely packaged in appropriate packaging before they leave our studios. We send all of our canvas art, prints, party stationery, birth announcements, milestone cards and puzzles via Australia post with SIGNATURE ON DELIVERY to ensure your items can be tracked and arrive safely to your door. Our delivery charges reflect the time and effort put into our packaging to ensure the safety of our products. groovy goose uses Australia Post to deliver all products, both within Australia & Overseas.